Thanks to a retweet from Klaus Dodds, I recently read this blogpost by marine ecologist Jon Copley on seabed mapping. Copley’s central message is that the statistics that we continually see reproduced in the media about 95% of the seabed being ‘unexplored’ and about us knowing more about the surface of Mars than we do about the ocean floor are oversimplifications. Different kinds of maps and ‘explorations’ reflect different knowledges and serve different purposes. Copley brilliantly moves from a technical discussion of mapping techniques (e.g. satellites vs. surface-based sonar vs. submersibles) and attendant issues of resolution and scale to suggest that our acceptance of depictions of the ocean as ‘unknown’ derives from our failure to ask more conceptual questions regarding the representative power of the map and the nature of knowledge. The piece brings together almost everything that I obsess on – oceans, mapping, the role of volume and the material-phenomenological properties of elements, and the limits of visualisation and representation in environments characterised by mobility and rapid changes of state. It’s a truly stellar piece. This means that the very properties of water that conventionally make one think of the seabed as being difficult to map are utilised by Sandwell to enable its mapping. In the popular imagination, and even in that of many oceanographers, the ocean is a static, opaque volume. Therefore efforts to see to the bottom of the sea are conceptualised as a process of seeing through an ideally transparent, but still static volume. These efforts at achieving transparency (which is a proxy for emptiness) are doomed to failure, however. The ocean’s opacity is constituted by molecular mobilities, and these mobilities — which serve to reassert the ocean’s materiality — will always confound idealisations of the ocean as an empty, insubstantial space that one can seamlessly see through. The brilliance of Sandwell’s technique is that the ocean’s dynamism and the properties of water that lead to its persistent re-formation are treated not as an obstacle but as an opportunity. Instead of understanding the ocean as something to see through as one seeks to map the seabed, water is reframed as something to see with. Volume, rather than being understood as a barrier to vision, becomes a means for achieving that vision. At one level, Sandwell’s technique isn’t that new: many sensing devices produce images by measuring the refraction of waves off of moving particles. However, the technique leads us to question common-sense understandings of water’s volumosity. Sandwell’s technique requires that we perceive water not as an undifferentiated mass of space but rather as an assemblage of energised molecules, a theme that echoes a point that I’ve made elsewhere, urging social scientists (of the sea, but of other spaces as well) to engage with the insights of Lagrangian fluid dynamics. Copley’s piece also leads me to reconsider the ways in which we so often use terms like depth, volume, opaqueness, fluidity, wetness, and liquidity as synonyms when writing on the ocean. Stuart Elden has opened up this dialogue by reminding us that volume is more than verticality. However, the nature of liquid matter goes, dare I say, even ‘deeper’ than that. In a piece coming out in the next issue of the Harvard Design Magazine, Kimberley Peters and I explore some of the non-visual dimensions of knowledge that the ocean’s liquid volumosity enables, and we develop related points in an article currently under review with Environment and Planning D: Society & Space. But Copley adds an interesting (and, for us, unanticipated) twist to our argument by suggesting that this volumosity can be used for visual representations as well. 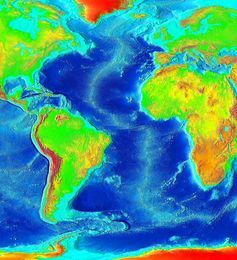 Of course, one can debate whether this is a desirable goal: If the static, two-dimensional visual representation of a map obscures more than it reveals – especially in a dynamic space of depth like the ocean – then should we be using the ocean’s voluminous liquidity to produce a ‘better map’ or should we be using it to rethink what it means to think of space as static? Copley, who is both a scientist (who utilises cartographic and other visualisations of liquid space) and a profound thinker (who questions their verisimilitude) tries to work toward both goals. At some point, Copley’s science may be challenged by the acknowledged partialness of the representations with which he works. But for now his ruminations on the challenges and possibilities (and misunderstandings) of seabed mapping open a world of perspectives for those of us ever on the lookout for new ways of seeing the sea. Phil Steinberg reflects on mapping, the sea, and the question of volume.